Great job over all, helpful in arranging inspection for the home. Very friendly and approachable. Had to remind of a few things but very fast to return messages etc. Michelle and Bill provide outstanding service and demonstrate not only a high level of dedication, but also integrity. I am impressed by their ability to problem solve while remaining very client centred. They are transparent and very trustworthy. We are somewhat experienced home buyers/sellers. 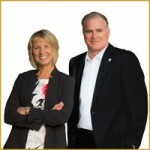 Bill and Michele are by far and away the most professional, experienced and honest realtors we have ever worked with. They listened to our ideas and concerns and offered outstanding advice on how best to market and ultimately sell our home. They guided us through the painful process of showings and provided us with prompt feedback on each showing. Their extensive knowledge of the market and vast experience was invaluable when it came down to negotiating the sale of our home. Again, they listened, and we were very happy with the final outcome of selling our home in a timely manner and at the price we were looking for. We would highly recommend this team, they were a pleasure to work with! Michele and Bill were pure pleasure to work with. During the "getting to know you" stage they took the time to understand me, genuinely sensing my values and treating me with tremendous respect. Their understanding of the market conditions and guiding me through all the decision making was invaluable. Another aspect of the Bill and Michele team that stands out above the others is their giving back to the community they live in. I constantly see them putting forth their time and energy to help make our community stronger. So, it's not all about selling and buying, it's also about giving and the Courtney & Anglin team are the absolute best! It was a privilege to work with you both. I have personally committed to give you the best compliment I can and that is to refer you to family and friends! Thanks for all you do!! During a stressful house buying trip, Michele provided genuine and honest guidance. Her wisdom and determination made a real difference to our experience. We wouldn't hesitate to use her and Bill's services again or recommend them.